While fishing on the Zambezi River, I turned around from the boat’s railing and saw my pink wallet suddenly being shoved back into my purse. At first, with the bright sun, I wasn’t quite sure what I had seen, but then I realized one of the two local fishing guides intended to steal money from my wallet while the other man was the look-out. Usually one for confronting mistreatment right away, I paused, realizing the two of us were alone on this fishing venture in the middle of the Zambezi River with the two guides. These were desperate times in Zimbabwe, with the continuing pillaging and mismanagement of the economy by President Robert Mugabe, not to mention his human rights atrocities. 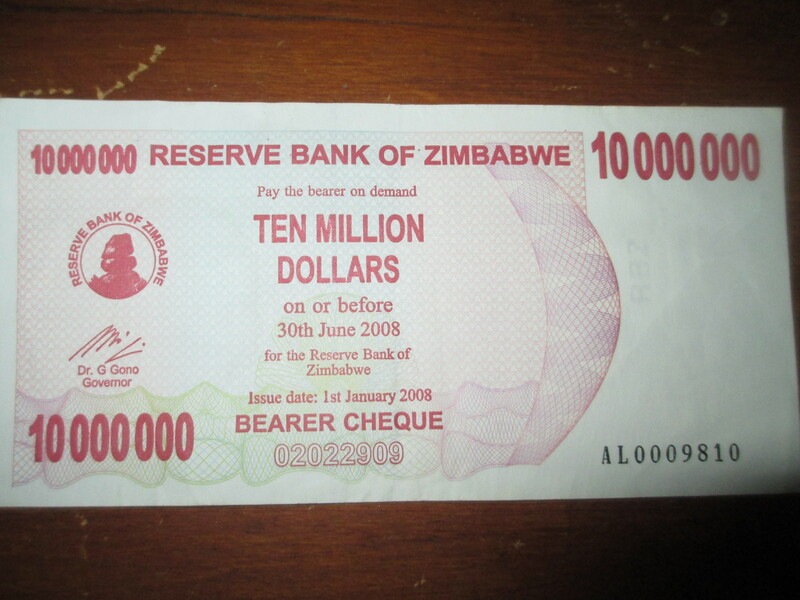 When we were in Zimbabwe, we were given local paper currency from the Reserve Bank of Zimbabwe in the amount of “Ten Million Dollars,” which at the time was worth a mere 66 cents. There was even an expiration date on the bill. It continued to depreciate so much that this past week Zimbabwe took their currency out of circulation. One can now exchange 35000000000000000 Zimbabwean dollars for $1 U.S.
As these thoughts quickly raced through my mind while on the fishing boat, I decided to casually meander over to my purse at the back of the boat, pretend to need my lip balm from it, and then carry it to the front of the boat where we were fishing. The river has a number of dangerous animals including hippos and crocodiles, and I feared if we confronted the two men that they might be desperate to protect their precious livelihood. We tried to look nonchalant while continuing to fish. We were supposed to take a sunset Steam Train across the Victoria Falls Bridge over the thunderous, misty falls, but the train wasn’t running due to the inability to pay for needed parts. Our tour had also scheduled a helicopter ride over Victoria Falls. If they couldn’t get parts for a train, I wondered about the maintenance of the helicopter. So that is one of the reasons we instead opted for the unique opportunity to fish on the Zambezi River. That option may have been no safer than the helicopter ride. 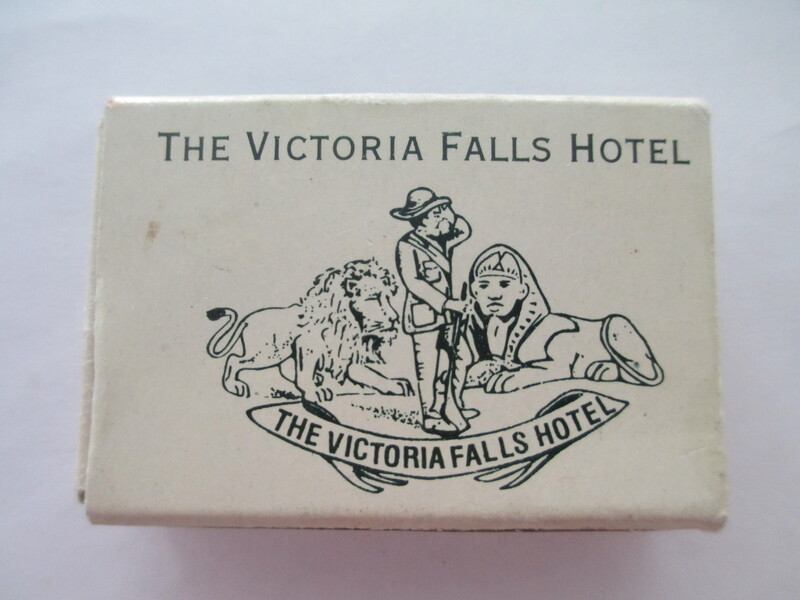 In both cases, we and all of our tour companions ended up safely back at The Victoria Falls Hotel where we watched the colorful sunset, flanked by mist from the Victoria Falls on one side and the baboons running around the grounds and up the walls of the old grand dame hotel.